The action took place in Zadar on 27. 10. 2006. 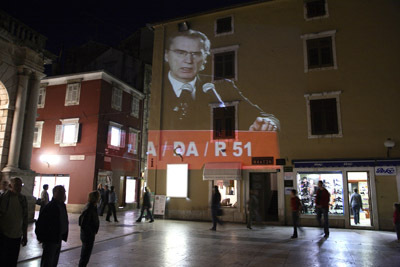 The artist read a speech by Josip Broz Tito, originally held in 1951 from the balcony at Narodni trg in Zadar. Video of the reading was projected onto the fa?�ade of the building at the square, but the speech was played back in reverse, from the end to the beginning, and was not understandable to the viewers, although the gestures suggested that it is public and political event. A video document (under the title: Comrades and Citizens) of this action is played in reverse again, so the speech became understandable, but people in the streets walked backwards. The work is about the past times which are erased by collective amnesia. Now, by this action, memory is brought forwards, but citizens went backwards. *Data recovery is a process of partial recovery of lost data from memory and without the appropriate context that gave the data positive, informational, social or other meaning before it was lost. As with the loss of data from a computer disk that can sometimes be partially retrieved, this process is an attempt to recover fragments of actions or situations that have disappeared in our all-pervasive social memory loss. It is important not to contextualize the event, because any subsequent contextualization is an interpretation, historization, or manipulation of lost memory.